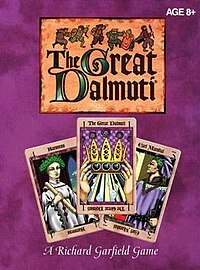 The Great Dalmuti is a card game designed by Richard Garfield, illustrated by Margaret Organ-Kean, and published in 1995 by Wizards of the Coast. It is a variant of the public domain game president, dating back to late Middle-Ages. The game was Awarded Best New Mind Game 1995 by Mensa, and was in Games Magazine's 1996 Games 100. The game fell out of print, but was re-released in 2005. Though based on a public domain game, the Dalmuti deck is non-standard. There is a number of each rank of cards (1 through 12) equal to that rank, so twelve 12s, eleven 11s, and so on. There are also two Jesters, which are wild cards. Each card in Dalmuti has a medieval name. Each rank is represented by an equal number of cards to its rank, except for the two Jesters. Dilbert's Corporate Shuffle was a Dalmuti spinoff based on the comic strip Dilbert. Corporate Shuffle used the same mechanic but was set in Dilbert's cubicle hell. The Dalmuti and Peon ranks were replaced by the Big Boss, Little Boss, Senior Intern, and Junior Intern. Taxation became Executive Bonuses, and Revolution became Corporate Takeover. Twirling Wedgie, a card with value 6 which also allows the player to choose another player who may not play any further cards in that trick. Ratbert, a single card with value 11 (worse than any other card) with the special rule that any player who wins a trick containing Ratbert must take it into their hand, unless no other cards were played in the hand or the trick winner played his last card in the round. Thus, this allows players a "free" chance to throw away a useless single, with the tradeoff that they'll have to offer the same chance to other players later in the hand. Dogbert, World Ruler, a single card with value 0 (better than any other card). The Dogbert, World Ruler card can only be played during tricks of single cards and immediately wins that trick. When executive bonuses are granted to the bosses, wilds are given first, then the numerical cards in order from smallest to largest. ^ Garfield, Richard. "Dogbert Rule Clarification". Board Game Geek. This page was last edited on 23 October 2018, at 04:21 (UTC).